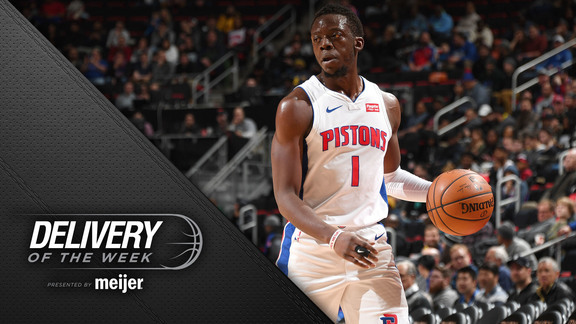 The trade market for players like Andre Drummond and Reggie Jackson, the return of Ish Smith and whether or not the Pistons have adopted a “win now” mentality dot the menu for this week’s edition of Pistons Mailbag. Charles (Redford Twp., Mich.): With Clint Capela out, how many draft picks would Houston give up for Andre Drummond? Langlois: Capela is expected to miss about six weeks. Unless the Rockets feel like their playoff position is endangered by his absence – they’re 25-18 and in the fourth playoff slot as of this morning, but there’s just a 6½ game gap between No. 1 Golden State and No. 9 Utah – I don’t see them making a move of that magnitude. They were reportedly willing to part with multiple draft picks for Jimmy Butler on the expectation that they’d sign him long term. Capela’s under contract through the 2022-23 season, so there is no chance the Rockets are looking to add another big-ticket center. Besides, they have a $132 million payroll. They can’t add Drummond’s $25 million without subtracting a like amount. They’ve already moved Ryan Anderson’s contract. I suppose they could deal Brandon Knight back to the Pistons to close the gap enough, though that would still leave them $11 million shy and there’s really no other contract ballast they could subtract without cutting into the meat of their rotation and create another problem that might not be solvable. I’m guessing they ride it out as best they can until Capela mends or do something more minor. They’ve got Nene and Isaiah Hartenstein, so it’s not like they’re bereft and it’s not like they’re an inside-focused team. Justin (Vista, Calif.): The Boston Celtics seem a very logical trade partner for the Pistons. Having Terry Rozier on an expiring contract that almost surely will not result in a re-signing makes him a logical and perhaps low-cost target to consider when looking for point guard depth while also giving the Pistons the inside track to sign him long term. Trading another first-round pick would be painful, but if the Pistons could send a larger salary – Jon Leuer or Langston Galloway – to perhaps bring back an additional shooting wing, perhaps a Marcus Morris reunion, it would both make them a better team now and for the long run. What are your thoughts on targeting the Celtics and specifically Rozier at the deadline? Langlois: I like Rozier well enough, but I’m not parting with a first-round pick for a guy of his ilk who’s headed for free agency. You’d have to be extraordinarily bullish on Rozier’s growth potential to part with a first-round pick for him even if he had multiple seasons left on a team-friendly deal. He’s proven himself as a useful bench player on a playoff-caliber team but beyond that you’re doing a lot of projection. Boston seems perfectly content to get what it can out of Rozier and let him walk in free agency because the Celtics already have four first-round picks – a few juicy ones, too – in the bank for the 2019 draft. They’re all in on making a run this season. Taking on big contracts for draft picks isn’t in their makeup at this point. Four or five years ago, you might have been sitting on a grand idea. Scott (@junioremert): Dennis Smith for Reggie Jackson and a third-rounder? Langlois: Since the NBA draft has only consisted of two rounds for the past 30 years, I’m not sure the inclusion of a third-round pick would sweeten the pot sufficiently for Dallas. I was high on Smith during his season at North Carolina State and believe with the right fit he could be an effective starting point guard. There were rumblings of the potential for personality clashes even before he got to college, so trade partners will have their eyes open on that front. Dwane Casey was Rick Carlisle’s top assistant when the Mavericks won the 2011 NBA title, so you can assume Casey will have everything he needs to know were the Pistons to engage the Mavs in trade talks for Smith, who by all accounts is available. Are you willing to part with a No. 1 pick? With proper protections applied, it wouldn’t be an unreasonable deal to send a first-rounder to the Mavs for a guy who was the 9th pick in 2017 and averaged 15.2 points and 5.2 assists while making 69 starts as a rookie. His minutes and role in the offense have declined – a function of Dallas putting the ball in rookie Luka Doncic’s hands and reducing Smith’s role and effectiveness, apparently – but his 3-point shooting has improved from .313 to .375. Phoenix and Orlando have been reported as the two teams most engaged and both are better positioned, given the run of very high draft picks both teams have amassed, to find something suitable to the Mavs, I would anticipate. But it’s worth exploring. I don’t know that Jackson would hold appeal to Dallas given its roster construction. The other Reggie, Bullock, might move the needle even though he’s on an expiring contract. Darrell (Detroit): I admire Tom Gores, but I’ve never been a fan of his “win now” philosophy. It sounds great but it rarely works. Just ask Redskins owner Daniel Snyder. Winning a championship requires a strategy that involves patience over instant gratification. I believe his win-now philosophy places too much pressure on Pistons GMs and coaches. Consequently, I believe the Pistons draft players they feel can help now over players that have the most upside. The same goes for free agency and trades. Perhaps Gores should modify his philosophy to match Bill Davidson’s if he desires to bring a championship back to Detroit. Langlois: I think “win now” doesn’t accurately reflect the marching orders Tom Gores has given to either Stan Van Gundy or the Ed Stefanski/Dwane Casey team. He’s wanted to be a playoff team but not recklessly – not at the expense of undermining the future. Other than the No. 1 pick the Pistons included for Blake Griffin last winter, they haven’t made moves that put any part of the future at risk. And you could argue that getting a player of Griffin’s stature without having to give up multiple future assets was a coup. It is fair to be critical of Pistons drafts under the Van Gundy regime. They aren’t getting a ton of impact out of Stanley Johnson, Henry Ellenson and Luke Kennard. (Van Gundy only had three No. 1 picks in his four years because of a trade made prior to his arrival.) But I don’t think for a second they took players they thought could help immediately over players of greater potential. Stanley Johnson turned 19 a month before the Pistons drafted him eighth. Van Gundy was so certain Ellenson, also 19 when drafted after one season at Marquette, wasn’t ready that he signed Jon Leuer in free agency within days of drafting him 18th. Luke Kennard was a sophomore when the Pistons drafted him and Van Gundy was pretty sure his defense wasn’t conducive to immediate impact. Besides, a common criticism of Van Gundy that preceded his arrival in Detroit was a reluctance to play young players. He wasn’t banking on immediate help from any draft choice, so to suggest he was prioritizing NBA readiness over potential in his draft picks misses the mark. Kevin (Las Vegas, Nev.): The Pistons are something like 4-13 since Ish Smith went down. Does this make Ish the MVP of this team? Langlois: They were 5-14 in the 19 games he missed before returning in Monday’s loss at Utah. What would they have been without Blake Griffin during that stretch? Andre Drummond? Smith is undeniably important to their success, the engine of a second unit that you could argue was as critical to the 13-7 record over the first 20 games as Griffin was. But I think their record during Smith’s absence speaks to the thin margin for error the Pistons, like a lot of teams, have more than anything. The second unit’s effectiveness fell off noticeably without Smith – compounded by Zaza Pachulia’s absence, as well – and that was enough to make the difference between winning and losing in a handful of games over the 19 he missed. So a stretch to say he’s the “most” valuable, but he’s valuable and they’re better for having him back. Aaron (New York): As a longtime Pistons fan, it’s been a very disappointing few years. The move for Blake Griffin was a “win now” type of move and I have no problem with it. But one thing that stands out to me is a lack of assists, particularly at the point guard position. Reggie Jackson ranks 26th in assists among point guards. If the Pistons ever want to go anywhere, they’re going to have to make roster changes. What would be a best-case scenario as far as a Reggie Jackson trade? Langlois: Jackson’s assists are down largely because the Pistons run their offense through Griffin predominantly. It’s no longer the offense that saw the ball in Jackson’s hands to initiate offense on virtually every possession. That’s not an argument that Jackson is playing particularly well because he clearly isn’t performing at a level that preceded his leg injuries of the past two seasons. Other teams see that, as well. There shouldn’t be any expectation that Jackson has significant trade value at present given his considerable salary. His shooting has dipped under 40 percent and he’s at .332 from the 3-point arc on a career-high 5.7 attempts a game. Casey said last week that he sees Jackson struggling on defense more than offense by way of explaining that he still believes Jackson is paying the price for his previous injuries and missing all of his summer training. At this point, it’s probably the case that the Pistons would need to attach something of value to Jackson in order to move the contract. A year from now, the last year of his contract, might be a different story. Then again, the hope is that with a full off-season for the first time in three years, Jackson will regain his passing gear and become the player he was in 2015-16 when he was a top-10 point guard. He’s just 28. It shouldn’t be the expectation that his career is in inevitable decline. Jason (Algonac, Mich.): I know you’ll shoot down any suggestion of “tanking” from reading past responses. That being said, we’re currently about eight games or so out of contending for home-court advantage for one round of the playoffs. What’s the point of getting into the playoffs as a low seed, losing in five games and having a likely pointless draft pick to show for it? So can coach Casey please give time to players who need development and are actually contributing more, such as Khyri Thomas, instead of players who haven’t shown they have it? Langlois: Other than Thomas, the only player who hasn’t been part of the rotation at some point this season is Henry Ellenson. And that probably would have happened, too, if Ellenson hadn’t missed more than a month with a sprained ankle. (He was declared ready to play in Monday’s loss at Utah after injuring himself in a Dec. 10 game at Philadelphia.) And Thomas has made appearances in each of the past two games and, as I wrote this week, has been declared by Dwane Casey to be in line for more playing time. Casey has said he views it as his responsibility to both win games and develop young players. He’s always going to lean toward winning games in that equation – any coach would – but he’s serious about finding opportunities to put young players in meaningful playing situations. And he’s generally more willing to play young players regularly than most coaches, as evidenced by the major responsibilities he gave to players like Fred Van Vleet, Pascal Siakam, Jakob Poeltl, Normal Powell, Delon Wright and A.G. Anunoby in Toronto over the last few seasons. At this point, if Casey is giving major roles to his two rookies, Thomas and Bruce Brown, it has at least as much to do with his belief in their ability to help win games than with his interest in developing them for next season and beyond.